89 contests in all, and as ever, not likely to be representative of the whole country. However, it is a significant sample, a good snapshot that provides something to mull over. I am always disappointed when Labour does not field a candidate in every contest. Boast as much as we like about being the biggest party in the UK, bigger than all the others combines some claim (and I doubt) but we rarely best the Tories in contests fought. In fact the struggling Liberal Democrats almost match us in this yardstick. There are, the candidate numbers suggest, still only three truly national parties. Both UKIP and the Greens still have some way to go before they can justifiably make this claim. David Cameron’s party are still enjoying a post-General Election honeymoon. At some point though, and sooner rather than later, Labour has got to start eating into the Tory councillor base. It is too early to start worrying about no nett gains for us yet, but if this continues through next year then we will have to rethink our strategy. Despite a miserable week health-wise, I did manage to put in a couple of hours yesterday evening in Rochford. I am glad I made the effort. We expected a tough, close contest. We knew we had a great candidate, and that he had a great team. In the end our efforts were rewarded. It was a close-run thing, necessitating a re-count. This was called for by the Conservatives who obviously felt that that four vote margin may have been counting clerk error – it was not. Beforehand we expected it to be a three-way fight; no-one expected the Liberal Democrats to achieve anything in a ward where they have been notable by their absence for the last dozen years. The Conservatives were favourites, not only did they win here in May, but their candidate was recently made widower by the tragic death of the Conservative councillor, which necessitated this by-election. See Softly softly (Rochford by-election) for previous results in this ward. Westborough Marimuthu Velmurugan Independent Group Now left group. Is defending, but will have an official Independent Group candidate up against him. This table shows who was elected in 2012, and whether they will be seeking re-election in May. Belfairs – I have no idea whether the Independent Group will put someone up against Stephen. The other Independent in that ward, who has fought both elections since 2012, is a friend of Stephen’s and unlikely to stand against him. Blenheim Park – Graham has been privately talking about standing down for some time. His recent ill health has likely strengthened his resolve to make 2016 his retirement year. Kursaal – Anne has chosen to contest her former home ward of Westborough. She did not seek re-selection in Kursaal. Leigh – This will be Peter Wexham’s comeback attempt, tempting headlines of “Lib Dems opt for youth”! I do not know whether Allan will seek somewhere else to contest. Shoeburyness – There is some speculation that defeated Independent Anne Chalk will continue her vendetta against Mike and stand against him in May. Southchurch – David has somehow managed to be de-selected, and end up with a brighter prospect in Prittlewell. However, this could be his swansong as Labour have high hopes for Prittlewell. Westborough – Marimuthu has chosen the route of total independence. This is a brave decision, in a ward that many are seeing as a certain Labour gain. If Matt Softly ends up winning next week in the Rochford by-election you can blame me; he became an activist after I knocked on his door one day. Sure, my blame is only partial, but I was there, at the beginning. The following table shows the vote share percentages for the four parties standing in Rochford, in local elections in this ward since 2002. UKIP are johnny-come-latelys here, and the Liberal Democrats rarely trouble themselves to stand in this neck of the wood. It has been a two-horse race for many years, even when other candidates have stood. It is either the Conservatives or Labour who triumph here, and I would be surprised if anything other than this was the case this time around. It will come down to turnout, I expect. In some quarters this will be seen as another test for the new Labour leader, although I have to wonder why some think that. UKIP’s presence introduces a test for their credibility after a poor General Election and a lot of in-fighting in Essex. The Conservatives will consider themselves favourites, if only because they are the most recent winners and their candidate is the widower of the recently deceased councillor who, tragically, is the cause of this by-election. However, I am calling a narrow Labour win here, a gain that will double Labour’s presence in Rochford District. Four MPs is a doubling of the Labour presence in the House of Commons. The Liberal Democrats are down three, whilst the Conservatives (with one gain and one loss) see no change in their overall representation. UKIP are a plus one on 2010. One of the more interesting statistics is that in all fifty-eight constituencies there was a swing from the Liberal Democrats to Labour. This is not true for the Conservatives, who can boast a swing from the Liberal Democrats in all but two seats; Cambridge and Clacton saw a swing from the Conservatives to the Liberal Democrats. In twenty-seven seats there was a swing from Labour to the Conservatives, making thirty-one where that swing was reversed – which is reasonably good news for Labour and its supporters. The smallest Liberal Democrat to Labour swing was in Clacton, where it was 0.2%. Consequently I take an interest in their elections, and the fortunes of our candidates there. I was delighted to see, for instance, my good friend Allan Davies re-elected in May. 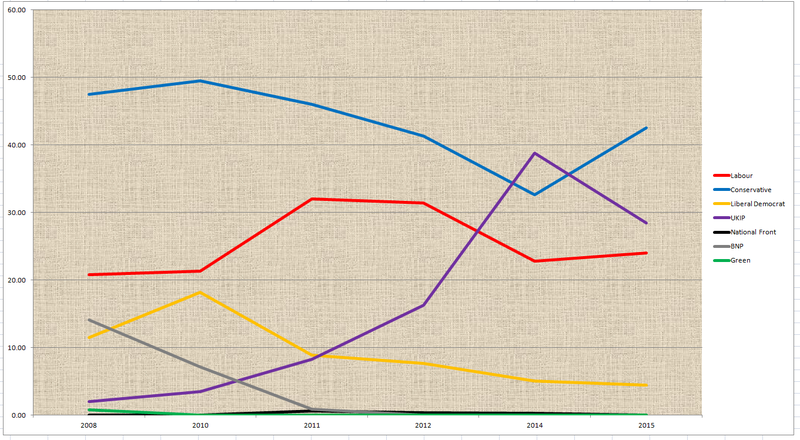 This chart shows the vote share for the parties in local elections in Basildon from 2008 up to today. Labour appears to be holding steady (ish), but it does look like UKIP is eating into some of the Labour vote – and this is probably partially hidden by Lib Dem switchers. I suspect that there is all sorts of churn in voter allegiance. It is a minority Conservative administration, with (I gather) unofficial support from the Independence Group. A number of thoughts race through your mind on being told you have been selected as a Parliamentary candidate; amongst these is the enormous responsibility that has been placed on your shoulders. Your members want a campaign that makes them proud to be a part of a political organisation, and regardless of your chances your owe them to have at least given it your all. I was selected last August, and I hope that I have worked hard enough. Despite the political climate that prevails in Southend West I think Labour did well. We finished a good second, hauling ourselves past the Liberal Democrats, as well as seeing off UKIP. Whoever follows in my footsteps, they will have the mantle of main challenger. Labour did well in the local elections, too, in this part of the borough of Southend-on-Sea, and we are well-placed in many wards now. I must thank all my opponents and their workers for their campaigns. There is no democracy without choice, and despite my disagreements over what they each stood for, I at least acknowledge that the Southend West election would have been less diverting without their presence. I wish Sir David Amess well in his role as my representative for the next five years. I also promise to play my part in challenging what he and his Government will be doing over that period. I have the memory of a foot broken whilst canvassing, many charming and inspiring conversations, hours toiling over a keyboard, and the encouragement and hard work of all those who gave their time to help in my campaign. I would finally thanks all those who voted, both for and against me. Democratic engagement is essential, and we only have to look to where in the world there is no democracy to see what a treasure we all have.